The Mannington Black Mountain Oak Fireside 080171 is part of the Flooring test program at Consumer Reports. In our lab tests, Flooring models like the Black Mountain Oak Fireside 080171 are rated on multiple criteria, such as those listed below. Resists foot traffic: Denotes how quickly surface wear was noticeable after repeated passes with an abrasion tester. Resists scratches: Indicates the ability to withstand dragged-object simulation. Resists stains: Indicates how resistant the floor is to staining from various products such as mustard, shoe polish, crayon, ink, bleach and peroxide. Installation Installation The manufacturer's recommended methods of installation. 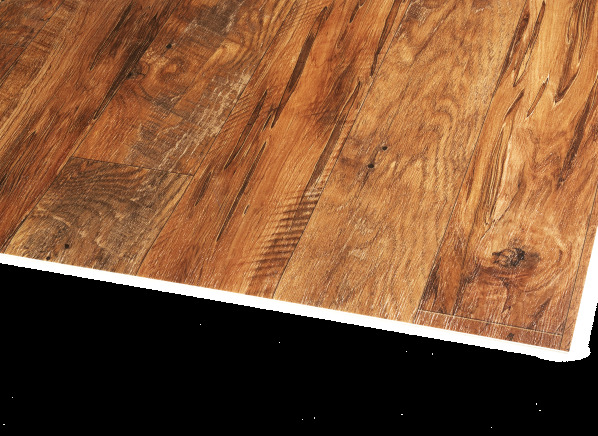 "Floating" floors can often be installed without an underlayment (depending on product), and don't require gluing or other means of fastening, such as nails or staples. Light shades Light shades Refers to the availability of light-hued products in this flooring product’s line. These siblings should perform similarly to the tested product for resistance to foot-traffic, scratches, stains, and dents, but the darkest floors in particular could fade more noticeably, given routine sun exposure. Medium shades Medium shades Refers to the availability of medium-hued products in this flooring product’s line. These siblings should perform similarly to the tested product for resistance to foot-traffic, scratches, stains, and dents, but the darkest floors in particular could fade more noticeably, given routine sun exposure. Dark shades Dark shades Refers to the availability of dark-hued products in this flooring product’s line. These siblings should perform similarly to the tested product for resistance to foot-traffic, scratches, stains, and dents, but the darkest floors in particular could fade more noticeably, given routine sun exposure.